Steve Scott and Stevan Walton have won England's first shooting gold of the Commonwealth Games with victory in the men's double trap pairs event. The duo scored 189 points to beat Indian pair Ronjan Sodhi and Asher Noria into silver. Malaysia's Benjamin Cheng Jie Khor and Seng Chye Khor took bronze. 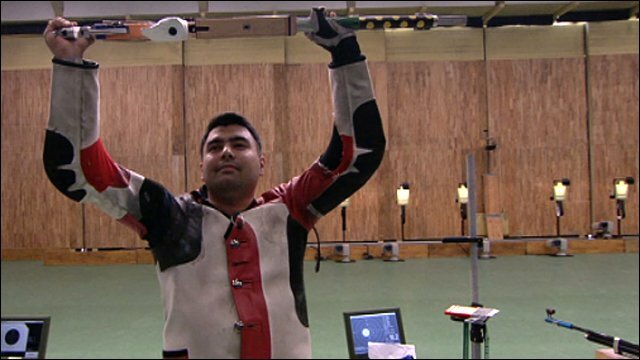 England's James Huckle earlier won his second medal of Delhi 2010, when he finished third in the men's air rifle individual event. Walton completed the first round of his final by missing just one target to record 49 points, with Scott scoring 46. At the halfway stage, however, the Indian pair of were still a point ahead at 96-95. However, the pressure of being hometown hopefuls appeared to tell on the leaders in the second round as they could only score 92, and with both Englishmen scoring 47, the final margin of victory was secured. Huckle's bronze came behind Indian stars Gagan Narang, with a Games record of 703.6 points, and Abhinav Bindra. The English shooter went into the final one place out of the medals, having shot 591 in his six qualifying rounds, two points less than team-mate Kenny Parr. But the 19-year-old from Harlow, who won two golds at the Commonwealth Youth Games in India two years ago, overhauled his pairs partner. "I just tried to concentrate on my shooting," said Huckle. "I didn't think about the bronze until after my last shot, when I checked the final scoreboard."